Airbrushing has one disadvantage. Before long your so vital air is infested with remainders of spray. If you use agressive solvents like thinner this is particularly harmful for just about anything in that is dear to you. But even the so called environmentally friendly acrylic paint bear a lot of fine dust into your precious lungs. I prefer to dispose of the fumes and the paint. The first incarnation of my spray booth was made from ply wood and a tube ventilator. The booth itself had a trapezium form groundplan. 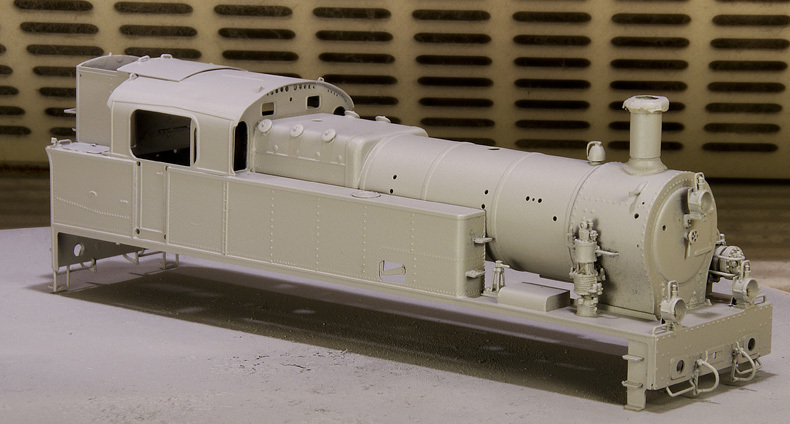 But when I put a first base coat on my Dutch Class 6200 in January 2011 I realized my spray booth’s ventilation was not up to the task. The fumes entered the shed despite the hard work of the small ventilator. Thankfully I had taken the precaution to wear a respirator as well. But the whole family complained terribly in the next few days. As the spray booth was too small anyway and poorly lit as well I discarded the whole thing and made myself a new one. When my conures (birds) left the house I had the opportunity to relocate my spray booth to my hobbyroom. I made a third version in which I stuffed all the lessons learned from the previous two. This version cannot be disassembled. The benefit of that is that its easily be lifted and put away in a matter of seconds, without going through the disassembly process. This way I can set up a paint session in a matter of minutes, do the job then put it away again. Most important is that the spray booth is now located in a well heated area and as I am usually modelling in the winter that is an important factor! and adding a perspex screen in the front. The latter allows air into the booth only via narrow arm holes thus creating a stronger air flow effectively preventing the toxic fumes from flowing back into the room. This screen is removable to allow work directly in the booth and consequently it is replaceable in case it might get clouded by fumes or spray over time. the perspex is very sensitive to thinner, as expected. the model hardly gathers any dust while spraying, a constant nuisance when working in my shed. the kitchen ventilation hood drew the air out so quickly that I saw my paint flow turn in a curve towards the hood, making it very difficult to aim at the model. I installed a dimmer to reduce the air flow in the booth. This gives me the advantage that I can adjust the air flow at will as needed, fast when spraying, slow when drying. The spray booth suited my needs quite well. I did make some improvements however. I installed a hook on the right side to hook up my spray gun when not in immediate use. It is a standard hook covered with a strip of insulation from a 220V power cord to protect the spray gun from scratching. The entire booth proved a bit cumbersome to handle so I installed handles on either side which made it much easier to lift. The biggest problem I had was in the halogen lighting. Good lighting is essential so I installed three 50W halogen spotlights. The light flooded the place and made it a good place to work. BUT the heat of the combined 150W halogen power played havoc in the small confined space of the booth. Thinner based paint, for which the booth was conceived in the first place, tended to dry too early. That is a problem in general but the heat of the bulbs aggravated that issue. I had also arranged two bulbs in the rear of the booth and one in the front, the latter in the middle. On more than one occasion I scorched my head's skin while taking a close look at the model. I soon pulled the plug of the halogen lighting. LED bulbs where the better solution but they where not of sufficient power, 35 Watt equivalent was the maximum available at the time. I worked with external energy saving lamps for some time. I replaced the halogen bulbs with 5,5 Watt LED bulbs of the same form factor as soon as they came available for a reasonable price. These are 50 Watt equivalent (350 Lumen) and have a light temperature of 2700K. They cost me €5.00 each. They hardly generate heat and save a lot of energy. :LED bulbs are feared for their peculiar lighting and this was true in their early days. The photo below shows both kinds of lighting with the white balance corrected for 2700K. There is only a slight difference. I had put my spray booth on a narrow table and I had been using it much to my content in the first half of 2015. Yet, the table under the booth was not quite comfortable as it offered little room for my knees. At some point in time my wife needed the table. A good reason to upgrade my booth with four legs. I screwed 44x44mm legs unceremoniously to the side of the booth with 50mm screws, fifteen per leg to give a bit of bite in the only 12mm thin side walls of the booth. Job done within an hour. It is now literally self-supporting and I have a place to go with my own legs. Now the table underneath is gone, which was wider than the booth, I can turn the booth facing into the room without interfering with the white door on the right. This makes access and working easier. A small but useful amendment was adding a bottle rack for my solvents and cleaners. Until now I put them on the floor which I find untidy and there's is the constant risk of knocking them over. The rack on work height also eliminates the need of bending to the floor over and over again, grabbing a bottle or putting it away while at work. While at it, I removed the handles on the sides that were installed to lift the booth unto the table. Now the booth has legs the handles have no purpose anymore.